There is a piece on The Catholic Herald‘s site (full disclosure: I write regularly for CH now) about Benedict XVI’s provision in Summorum Pontificum and Universae Ecclesiae by Alcuin Reid who reedited Fortescue/O’Connell Ceremonies of the Roman Rite Described. It may seem rather odd that Pope Benedict XVI?has expended so much energy on rules about the use of the old “Latin Mass” – after all, it would appear that most Catholics are content with the modern liturgy in the vernacular. [Which, to date, they really have never experienced. The new translation will help to change that. But… quaeritur…] Why, then, yet another set of rules from Rome in this Instruction? And then there is the more recent historical reality of widespread opposition to the use of older liturgical rites (not just the Mass, but the sacraments and the blessings and so on, as the Instruction makes clear) on the part of bishops, religious superiors and priests. That is why the Instruction was necessary: even after Summorum Pontificum established that in Church law everyone who wants the older liturgy is entitled to it, this opposition continued, sometimes [often] from high-ranking prelates. This Instruction underlines these rights and makes explicit what was implicit in Summorum Pontificum, namely that if these rights are denied Catholics, be they laity or clergy, have the right of appeal (“recourse”) according to the norms of canon law. It is unusual for Rome to advertise this in an Instruction, but in the light of the opposition it seems necessary. Good analysis and he is surely correct about most of his points. Even his guesses are rooted in sound reasons. There won’t be a New Evangelization without a renewal of our worship. This entry was posted in "But Father! But Father! ", Brick by Brick, Linking Back, New Evangelization, Our Catholic Identity, SUMMORUM PONTIFICUM, The Drill, The future and our choices, Universae Ecclesiae and tagged Alcuin Reid, Benedict XVI, Catholic Herald, SUMMORUM PONTIFICUM, the tip of the spear, Universae Ecclesiae. Bookmark the permalink. The freeing of the EF Mass and sacraments is needed for pastoral care of the faithful. However, conferring Holy Orders in the Usus Antiquior is not a “need” but a “want.” And bishops would then be in a difficult position if petitioned by seminarians. The bishops who didn’t want to ordain in the Extraordinary Form would be the bad guys, so to speak. I think the Holy Father was very wise, in this respect. As things stand, bishops who have no desire, at all, for the EF Mass, are not in any way obligated to get involved–it is a matter for pastors to decide on their own. But once you say you are going to make EF Ordination an option, you necessarily involve the Diocesan Bishop in something he may want no part of, and that is a fight which the Holy Father wisely decided should be left to another day. The freeing of the EF Mass and sacraments is needed for pastoral care of the faithful. Father Sotelo, I can agree with the above statement to a point, but am left wondering if there is more to it. Is the purpose of the Mass exclusively, or even primarily to serve the spiritual needs of the faithful? If so, why can’t I fulfill my spiritual needs on Sunday by saying a Rosary at halftime while sitting in my Barco lounger? I, too, found it quite curious that they restricted the use of the EF form of ordination. While I am sure that if a bishop asked permission it would be granted, the document doesn’t promote its general use. Then again, I do agree with what Fr. Sotelo said above. One fight at a time. Found it…. Nat’l Geographic, Vol. 157, No. 3, March 1980. It has a photo. of Nan Tang Cathedral in Bei’jing before the interior was wreckovated. The photo. caption says, “Attendence was nil” which par for the course for Nat’l Atheo-graphic. Dr. Reid’s conclusion that communities not under the PCED, but which regularly use the 1962 liturgical books, may not be able to avail themselves of the older rite of ordination seems to conflict with the language of Paragraph 31 which provides that in Institutes and Societies under the PCED “and in those which use the liturgical books of the forma extraordinaria” the older rite may be used. The anomaly which Reid perceives does not seem to be borne out in the language of the provision. Not that I’ll be around to see it celebrated, at least not on earth. However, I hope one day that all the travails of the present age will yield one use. To coin a phrase for a generation to come: One Rite; one Use! Mass atenndance in the U.S. is at 25%. 75% of Catholics do not go to Mass. That is a colossal proof of total failure. It is not just a majority like 51%, but 75%. It not two-thirds, but 75%. 3 out of 4 Catholics do not go to Mass and are not content with the modern liturgy in the vernacular. Catholics have voted with their feet and do not go to the new rite and new Mass. 3 out of 4 Catholics have stopped practicing the faith or have become Protestants. Speaking about forms and rites is indeed interesting. Since October i follow the Ambrosian usus antiquior on Sundays; the rite does not have Judica me (but begins with Introibo), no (or different) Kyrie, no Agnus Dei, Credo after the offertorium has begun, but before the Canon (which is almost exactly the same as the Roman) and other minor differences (in Mass; then comes other things such as six weeks of Advent and no Ash Wednesday, as in the really old Roman rite). In the Confiteor, following the confession and before “misereatur …”, “Deo gratias!” is added, and I can’t stop meditating, Sunday after Sunday, about the beauty in how the Church rejoices at the confession of sins before remitting them (ALL of them, as it is said “… et dimissis omnibus peccatis vestris …”). I really do love our local Rite. All of this just to say that the ancient Ambrosian rite is – feels? – closer to the traditional Roman rite than to either of the reformed rites. 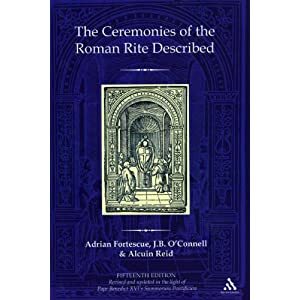 I’d say that between the usus antiquior and usus reformatus of the Roman rite, the differences are bigger than between the Ambrosian and Roman rites. I really do hope that people like Dr Reid will dwell more on this for the edification of us all. Perhaps something from you, don Zeta? Ever since Summorum Pontificum came out, I have argued that the Pope provided a juridical solution to the relationship of the EF and OF, but he did not settle the issue of whether there were two distinct rites. They are, in fact two usages of the one Roman rite. If the Holy Father said that the missal of Paul VI and the missal of Pius V/John XXIII are two usages of one rite, how did he fail to settle the question of whether they are two distinct rites? Doesn’t he in fact make it clear that they are two usages of the one Roman rite? No matter how small the stable group of faithful is, I’m certain ONE does not count as such a group. I’m pretty certain that I’m the only one in my parish who asks for the older form of Holy Mass. And this is unfortunate, as I feel I have an attachment to these older forms, though I have had very few chances to attend them in my diocese. It also messes with my discernment to religious vocations of any kind, as there seem to be very few clerics who understand my attachment to these older forms, and as I don’t get the opportunity to expeience the older forms I would probably never be accepted by orders/institutes that specialize in them. MichaelJ: Yes, the Mass, or Divine Liturgy, primarily exists to serve the spiritual needs of the faithful (the clergy are also faithful, although they are not lay faithful). The liturgy, in Western or Eastern forms, certainly is not serving some need that God has. It is the faithful who have need, first, to render glory to God (extrinsic, coming from creatures, as opposed to intrinsic, which He possesses in Himself). Then, the faithful have need to edify the Mystical Body of Christ, Holy Church. Finally, the faithful have need to work out their personal salvation in fear and trembling. You asked, “If so, why can’t I fulfill my spiritual needs on Sunday by saying a Rosary at halftime while sitting in my Barco lounger?” You could, if Our Lord had stipulated this. But insofar as He commanded at the Last Supper, and the Apostles testify to this in their preaching and practice, that the Mass is the means to accomplish the re-presentation of Calvary for the ends stated above (and not your Rosary recited in your Barco lounger), then that is what the Church orders as being of positive divine law and ecclesiastical law binding on the faithful. Thank you, Father Z. You have gotten right to the heart of the matter! I offer my own reflection on this subject, published on my blog for the Feast of the Epiphany. 2. The liturgy is not a “treasure to be preserved” but instead a tool to be used (and modified or even discarded at will) to meet the needs of Man. You know what would be awesome. If we had the magazine “Magnificat” come out with an edition for the Extraordinary Form. On the surface this is a reasonable question and I agree with it in principle. The answer, I believe, lies in the translations. If horribly bland ICEL texts are used for the readings or prefaces then the damage to the TLM could be severe. Father Z: I don’t have a book with the Anglican Use. Perhaps it is one line. Some might say it has some of the look and feel of a Tridentine Mass, but in Elizabethan English (though it has both Novus Ordo and Anglican elements). If horribly bland ICEL texts are used for the readings or prefaces then the damage to the TLM could be severe. But of course, for the TLM, the Latin originals of the new prefaces would be used. However one feels about the general question, in Latin many of these prefaces have the same kind of structure, depth, and elegance as the familiar TLM prefaces and, moreover, the much better corrected translations are now available for those who’d want to follow them in English . Perhaps you are extrapolating from my post because you believe God wishes to be worshipped according to a particular form (the EF Mass?). When my post doesn’t go in that direction, maybe you think I paint God as “indifferent”? I think that the Mass or Divine Liturgy, offered well by the priest and prayed well by the people, is extremely important to God. But no, I don’t think God is going to favor one form over another. As far as the liturgy as treasure, I agree, except not as a museum piece, not as an artifact which stands apart from the work of salvation of souls. And the liturgy as treasure, to me, extends to all the rites and forms. The Mozarbic form is a treasure. The Byzantine rite is a treasure. And even the OF Mass is a treasure. But each form of the liturgy, in the respective rites, is a treasure because by that means, God is glorified, the Church is built up, and souls are saved. The liturgy is not a treasure in the sense of a Faberge egg. Its value as treasure is because it has a purpose for us, the people, in God’s plan. And when we, the people, after the End and the General Judgment, no longer need the liturgy, it ceases and has no more existence. And so, yes, God will “discard” the liturgy when it is no longer necessary after the end of the world, not in a contemptuous way, but like all things, “the old order has passed away. See, I make all things new. I am the Alpha and the Omega.” Or to use the words of Our Lord, “the Sabbath was made for man, not man for the Sabbath.” The liturgy serves God insofar as God and the Church use it for the sanctification of souls. If the liturgy did not serve God for the good of souls, it would neither be a treasure, nor would it be worth preserving. RobertK: Yes, indeed, an EF edition of the Magnificat would mean the restoration is truly at hand. But I suspect we’ll have to see a papal TLM first. Here is an Anglican Use Requim Mass. Looks very similar to a TLM. Very nice choir as well. I am not keen on the term, “Extraordinary form”. I’ve taken to calling it the “Elder form of the rite”.